You know, it’s funny what a young man recollects, ’cause I don’t remember being born. I don’t recall what I got for my first Christmas and I don’t know when I went on my first outdoor picnic, but I do remember the first time I laid eyes on Naledi Bushcamp. We were slightly exhausted from our nine hour journey from Joburg. That seemed to instantly disappear when we pulled into Naledi. We were greeted by the owner Kjell and the front of house TK. A warm smile and gracious welcome were accompanied by a chilled cocktail. Our bags were whisked away and we were ushered to the bar to check in. I marveled at the liquor selection and smiled to myself, Sally and I were going to do just fine here I thought to myself. The schedule of the safari was explained before we were escorted to our room. The morning drive leaves at 6am and the night drive at 3:30pm. 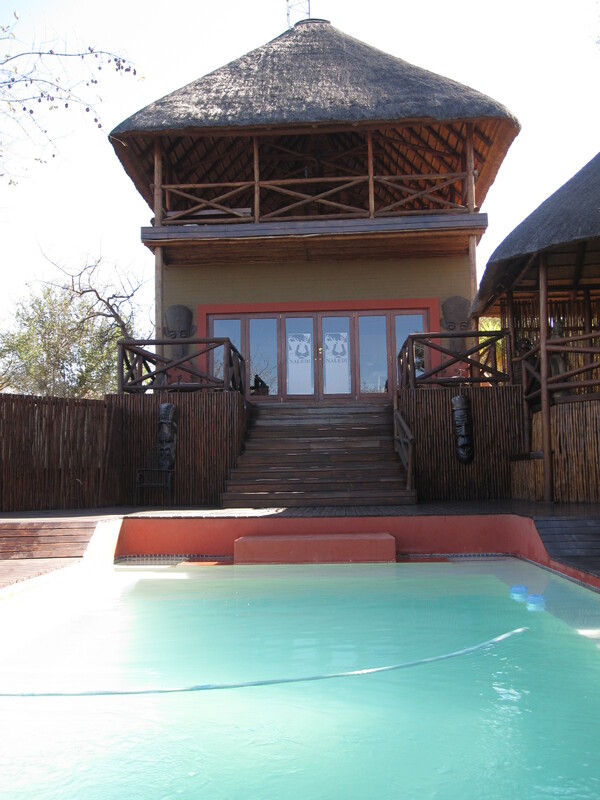 Both drives are approximately four hours, longer if game viewing is going exceptionally well. Breakfast is served after the morning drive, followed by the option of: visiting one of two hides for an hour and a half, a walk with one of the trackers to learn about the bush and tracking animals, or hang out at the camp and enjoy the facilities, which by anyones standers are nothing short of amazing. The general area is composed of a bar and lounge, an open air viewing area up stairs, and a massive spread of decks that surround the pool, serve as the dining area, and work their way down to hang over the riverbed. The entire camp is decorated in a manner that one would imagine an African safari lodge, but with a tasteful eye, as to not overdue or degrade the experience. TK took us through the wood carved door of our room and showed us the suite that would serve as our home for the next six nights. The quality of decor continued from the camp and fulfilled every expectation of what a pampered safari room should look like. From the massive bed, framed with the wood carved headboard, to the outdoor shower. There wasn’t a single thing I would have changed about the layout. We had missed the afternoon drive and had some time to kill before dinner was served. We enjoyed a glass of wine and looked out over our private deck. Taking in the beautiful South African sunset. A sight that seems to bring its own uniqueness with each night. Dinner was served at 7:30pm and it set a precedent that didn’t falter throughout the duration of our time at Naledi. The three-course meal was perfectly cooked and wonderfully displayed. The quality easily on par with that of any five-star restaurant. Kjell joins the guests for both dinner and breakfast. Making himself available for any questions you might have after the game drive. He expressed that “You are seeing and doing so much on a game drive, that you may not get the chance to ask a particular question or maybe you have some thoughts after a viewing and would like to know more about a particular animal or scenario.” The fact that he makes himself available and is extremely knowledgeable is really just a side note to the act of playing a gracious host. During our six night adventure we saw several guests come and go. Their nationality, cultural background, and preference of conversation as varied as you can possibly get. Kjell was able to intelligently contribute to any subject and ensured the conversation made its way back to a topic that everyone could enjoy. Our first morning game drive had us full of excitement. We hadn’t really set any preconceived expectation of what we thought we might see or how the drive was going to be conducted. This was our first Safari and we really wanted to come in and just experience it for what it was. The camp only had seven guests our first drive, leaving the nine person jeep feeling spacious, and allowing both Sally and I to sit in an outside seat. 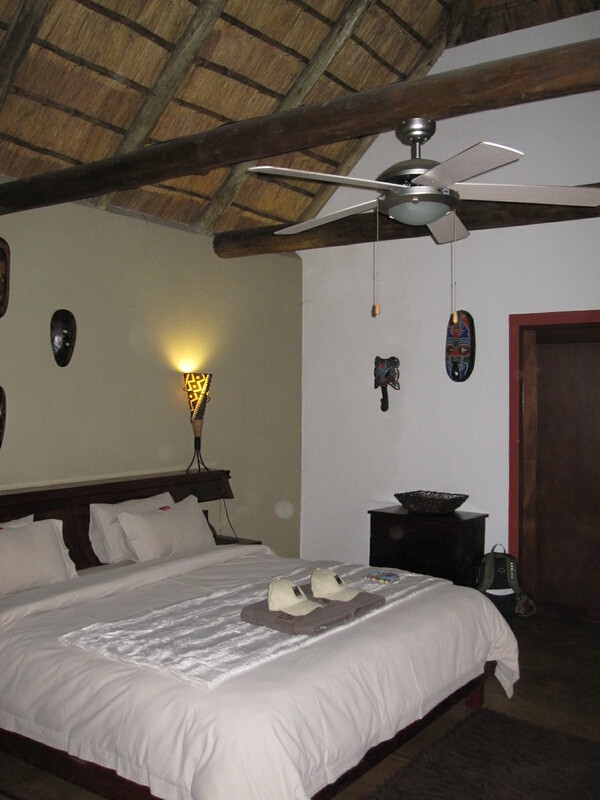 Naledi Bushcamp only has occupancy available for nine guests. Kjell wants to provide an intimate and personal safari experience, a feature that drew us to this particular camp over that of his competitors. Kjell explained some general safety procedures and outlined how he planned on conducting that particular drive. He won’t guarantee the sighting of a certain animal or an animal at all for that matter. Kjell explains how the reserve opens up to several million hector, to include Kruger National Park, and that the animals are in fact wild. Thus unpredictable in movement. This humble and anchoring forewarning is little more than a disclosure of the unlikely. With Prem the tracker up front and Kjells decades of experience, it is only a matter of time. Our first morning took a little more time to spot an animal than I expected and when it was all said and done, quite a bit more time than it took on all of the following drives. Prem spotted the tracks of one of the lioness that is known to frequent the area and we spent an hour and a half trying to track down the location of the lion. To include a large portion of time where Prem was off on foot scouting the area. Being my first drive my excitement quickly started to fade. I questioned if this procedure and amount of time was how all big five were tracked. I doubted our ability to see a lion within the five days we would be at the camp, let alone close enough to snap a photograph. 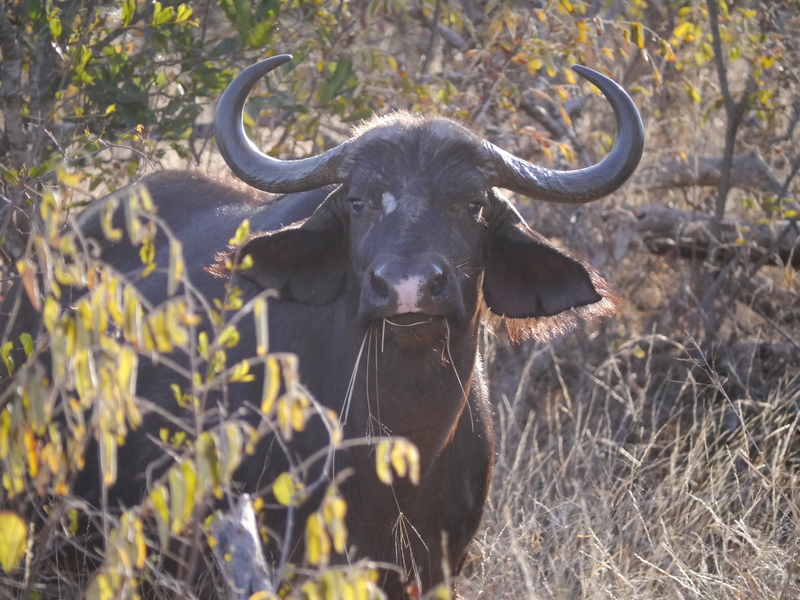 We did manage to spot several of the plains game and two buffalo (one of the big five) behind some trees. I felt slightly discouraged, but that would prove to be the most uneventful drive of our entire stay. It was also quickly turned around when Prem spotted some elephants on our way back to camp. Five massive bull elephants were making their way through the bush, ripping and destroying any tree that got in their way. Kjell strategically placed our vehicle to be close, but out of danger. The largest of the group actually made his way only feet from the Landcruiser. Apparently he is very comfortable and curious of the tourists, providing excellent photo opportunities. Breakfast was just as decadent and rewarding as dinner the night before. 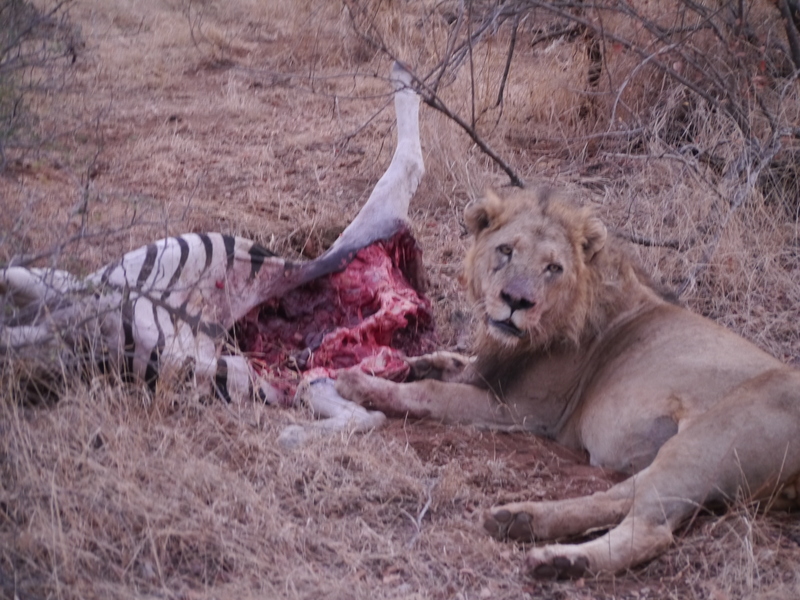 I thought to myself, I may not get to see all of the big five but I will most certainly enjoy eating like a king! After breakfast Sally and I decided to visit one of the hides as our afternoon activity. We were taken out to the hide that over looked a watering hole. An ice chest with beer was our refreshment of choice as we discussed the remainder of the time ahead of us. The peaceful surroundings, excitement of finally being on our safari, and of course beer, proved to be a wonderful experience in the bush. Unfortunately our noise control was lacking and we ended up limiting our sightings to only a few monkeys and some birds. On the afternoon drive it was less than 20 minutes before we were tearing off to a white rhino spotting. Kjell works with a few other lodges in the area to help spot the animals and ensures everyone gets to enjoy the experience. The massive white rhino took us on a 15 minute stroll down the road before he stopped and posed for pictures. On our way back to the lodge, just before sundowners (a beverage consumed while enjoying the amazing South African sunset) Kjell and Prem spotted several vultures looming in the trees. They both got off on foot to see if they could spot what had captured the scavengers interest. They were unsuccessful that afternoon but the following morning proved to be the most fruitful sighting of the entire trip. We drove straight to the area the next day to see if we could spot what the vultures had already keyed in on the day before. As we came around a bush next to the watering hole Kjell spotted what we were looking for. Bigboy, the alpha male of one of the prides in the area was chewing on the back part of a zebra. I don’t remember the last time I actually saw a lion? Only in Zoos and of course on T.V.. But this was the first time I saw a real lion. A lion that had scars on his face and body, hardened from the bush and battles for his food and life. This particular male was on the downslope of his life and dominance in the pride. Kjell said that Bigboy was 18 years old and has failed to chase his five (5-year-old) sons out of his territory. The scenario is either they go or he goes. Once off his own territory he would be faced with the ongoing battle to survive on opposing prides land. A life change that more than likely would result in the end of the Bigboy era. As we sat and watched Bigboy laze about, bloated from his feed, you couldn’t help but develop an affection for the fading king of the jungle. The remainder of the drive was filled enjoying the planes game: zebra, Impala, Springbok, giraffe, etc (a complete list of what we saw each day is listed at the bottom, along with a photo link). During the afternoon drive we were lucky enough to find a buffalo herd, composed of nearly 100 of the massive animals. Kjell excellently placed the vehicle in a way that the herd split and walked around us. The large bulls walking just feet from the car while the mother and baby buffalo trotted around us in a more half circular fashion. The third day began with our now usual visit to Bigboy. Inspecting the progress of his feed and his ability to keep from sharing the zebra with other predators. We watched Bigboy tear at the flesh of the zebra for a good ten minutes before he decided he had his fill and retired to his napping spot beside his pray. Just as we pulled away from Bigboy Kjell got a call from one his crew that two black rhinos were walking in the field next to the river. The animals are fairly elusive as they just arrived in the park less than a year ago (implanted to help preserve and grow the population) and they are not used to the vehicles. As with all the big five animal spotting potentials, Kjell navigates the roads with an impeccable balance of rally car driver and soccer mom. Making his way over the bumps and around the corners with a controlled speed that gets you there as quick as possible but still letting you feel safe and confident in his abilities. We came into the open field and Kjell quickly spotted the rhinos. As always, he positioned himself in a way that allowed the animals to feel comfortable, while getting us extremely close (no need for a large lens for your camera on this safari!). The male and female pair had just recently started traveling together. The hope of generating more of these animals is looking promising on the Naledi safari grounds. We watched as they fed and showed affection to each other. They would walk close to the vehicle to inspect it, not able to fully make it out until they were 10ft away due to their poor eyesight. It was quite humorous to watch their expression change as they approached. From curiosity to an almost startled look once they can actually make out that it is in fact a vehicle. 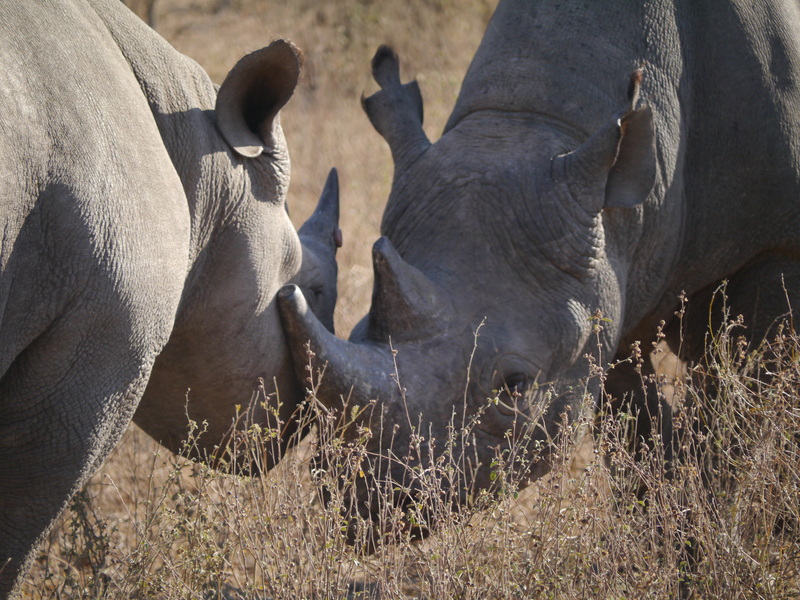 The female rhino at one point made a small gesture of aggression toward the vehicle. Then realized we weren’t scared or moving, causing her to retreat into the bushes. At the end of our night drive we were heading home and feeling quite good about the days events. With Bigboy, the black rhino, and buffalo, we were at 3 out of the 5 big five in one day. Everyone was full of excitement and ready to see what extraordinary dish was prepared for dinner. Just as we pulled around the corner close to camp a lioness came out of the bush onto the road. She made eye contact with us and then casually trotted into the bush. Game viewing being the priority of the lodge we pushed back dinner and followed the lioness for the next ten minutes. The night was just cooling down and Kjell told us the pride is waking up and getting ready to hunt. It was just moments later that two eight month old cubs came running past the truck. They were out looking for their mother and spent several minutes next to us. Their aunt arrived shortly after and gave a quick gesture of affection before directing them in the direction she came from. The cubs were off and the aunt came to hang out with her sister, the lion we followed into the bush. The two lioness were extremely receptive to one another and had a little play fight before plopping down into a pile together. The fourth morning several guests, Prem, and Kjell reported they heard the roar of the lions as they moved through the bush during the night. Kjell predicted that based on the distance of the roars, Bigboy may no longer be eating alone. We made our way to Bigboy and found him stretched out next to his food, alone. The next hour and a half was one of the more exciting moments of my life and something I will remember forever. As we sat watching big boy he suddenly lifted his head with a quick jerk. A few twitches of the ear, wiggles of the nose, and he was up, fully alert. He started growling and positioning himself in front of his kill. Behind us a young male lion appeared, followed by a second, a third one, four. All five of his sons were creeping through the grass. Four of them made their way to the water hole, trying to express they had no interest in challenging Bigboy. While one came to the front of the truck and plopped down. The video below shows the slow creep toward the zebra and Bigboy’s displeasure with the situation. This was it! This is what I came on Safari to see. A lion fight and feeding frenzy just feet from the vehicle. We watched as Bigboy and his five sons devoured the remainder of the zebra in less than 45 minutes. Bigboy getting the largest portion and occasionally slapping one of the younger lions to remind them whose food they were eating. I didn’t think the day could get much better. It was surely the apex of the safari. Up until that point each drive had been better than the one prior. It was as if Kjell had an arrangement with the animals. He couldn’t have scripted a better tour of the bush. His constant reminder that animals were unpredictable and he couldn’t promise a sighting was a distant memory and a humourous statement at that point. It was completely overshadowed by his tracking ability, placement of the vehicle, and excellent timing. I was ready to head back to the camp for another excellent round of lunch. But the drive wasn’t over yet! Kjell got word over the radio that the group of bull elephants were making their way through the riverbed. We raced toward the riverbed and passed another truck that was positioned on top of a hill. Kjell explained he wanted us to get an up close and personal view of the group. We pulled into the riverbed and placed the vehicle on the left bank of the dry sand. We watched the older bulls drink from the water as the young elephants wrestled for dominance. The group then made their way down the riverbed toward our location. Everyone in the vehicle sat in amazed silence as the group of bull elephants made their way around the Landcruiser. Sally and I sat in our room after breakfast in amazement. What could possibly be next? We must be in for a boring drive in the afternoon? Statistically speaking, we had to have a drive were we didn’t see one of the big five. Up until this point it had been at least one every drive and three in total each day. As we took off on our afternoon drive Kjell mentioned his desire to show us a leopard to complete our big five. To be honest, I had little faith in our ability to spot the animal that enjoyed the spotlight the least of the big five. We had been in the Pantanal in Brazil a few weeks prior, a place that travelers also go to spot leopard. If there was a score kept on those that actually accomplished that goal, it would be drastically one-sided in favor of those who don’t. I smiled to myself and knew we wouldn’t be seeing any leopard on this trip. But the fact was it didn’t even matter! The experience that Naledi provided us was bar none the best anyone could have hoped for while visiting Kruger. The small details that they pay attention to are amazing. Heater on when you come back from the morning drive, AC on when you get back from your afternoon activity, fresh towels after every shower, a different cocktail waiting for you after each night drive and a genuine smile and greeting from every staff member. I had mentioned to another guest during one of our sundowner sessions I would love to try some good biltong (South African version of Jerky. Putting American jerky to shame). The next day Kjell had some biltong for me to have with my beer at the sundowner. How good is that!? The evening drive found us content with our experience and ready to just kick back and enjoy watching others experience their big five spotting for the first time. It was just about the end of the drive when Kjell got word from another camp that a leopard had drunk from their watering hole. As I mentioned before, Kjell does his best to get the vehicle to a big five spotting as quickly as possible. But this time he really put his foot on the gas. We had about a fifteen minute drive to try to spot an animal that probably heard us the moment we started heading in his direction. There was no way we were going to be able to track this animal down in the pitch black night. Prem was swinging his spotlight from side to side as Kjell flew down the road. We made it to the area and Kjell eased up on the speed. We crept down the road, fingers crossed, eyes scanning the treeline, and then it happened. Prem spot lighted the leopard under a tree marking his territory. 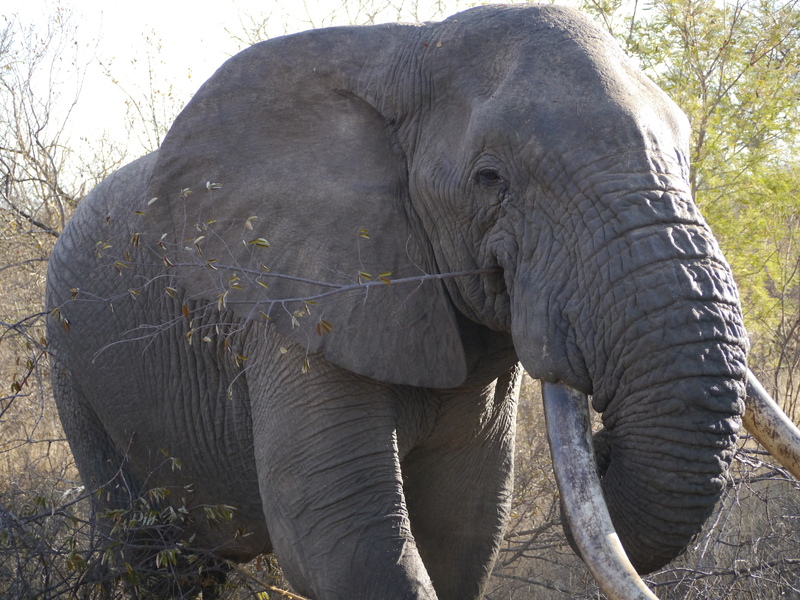 We got close enough to take a video of the last member of our big five check list. Our final day on Safari was just as productive as the rest. Kjell eagerly showed the new guests the bull elephant heard as they destroyed his trees next to the watering hole. He was also able to track down the black rhinos again. It amazed me how he maintained the same energy and enthusiasm for each of the drives. I actually started to understand his motivation behind being excited for every animal spotting. Each viewing was unique and provided a new perspective of the animals. We ended our time with Naledi by watching the three eight week old lion cubs venture out of their hiding place for one of the first times. Even Kjell had yet to see the cubs. Everyone sat awestruck at the adorable cubs that start life so innocent and end up being such a dominating beast that they became known as the king of the jungle. Warthog, Kudu, Giraffe, Zebra, Black Back Jackel, Lion (Bigboy fight), Elephant, Leopard. Elephant, Lion (male/female mating), Black Rhino, Warthog, Stenbok, Grey Daker, Waterbuck, Lion cubs (8 week), Lion (male calling for pride), Crocodile. What an amazing tale! I feel as though I was there with you. It couldn’t have been better wrtten for their ad.